LOS ANGELES, California — Socialist Sen. Bernie Sanders (I-VT), who is running for the Democratic Party’s nomination for president, appeared at a rally of over 1,000 striking workers and students outside the campus of the University of California Los Angeles (UCLA) on Wednesday afternoon in a show of solidarity and a pitch for labor support. “I am here for you today not as a candidate for president but as somebody who has spent the last 40 years of his life walking on the picket line with workers,” Sanders told the cheering crowd — and he kept his word, barely mentioning the 2020 campaign throughout his remarks. 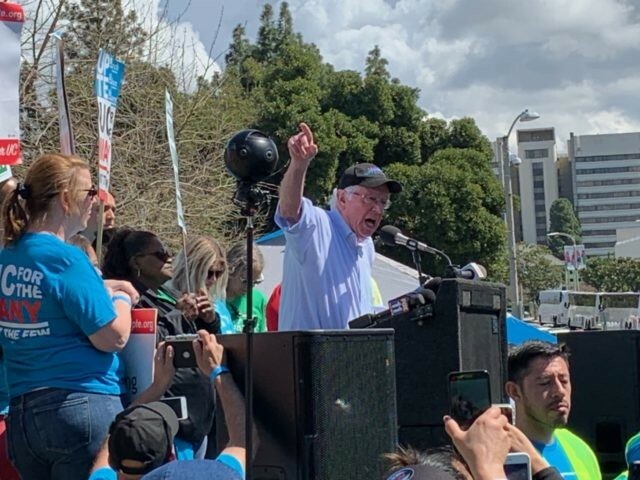 Sanders was the guest of the UPTE-CWA 9119 union “representing 14,000 research, technical and health care workers,” throughout the University of California system, according to the Sacramento Bee. The union, which is trying to negotiate a new contract with the university, called a 24-hour strike; the 25,000-strong AFSCME 3299, the largest union in the UC system, walked out of work with them. The university slammed workers for putting patients at risk: some who need blood tests will have to arrange to have blood drawn elsewhere, for example. But the workers are furious at an administration they say has mismanaged the university’s finances. UC president Janet Napolitano, who served in President Barack Obama’s cabinet, was found by a state audit to have used misleading budgeting practices to hide $175 million for the use of her office. 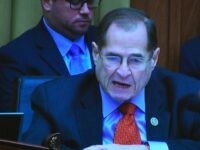 Her office then tried to cover up its malfeasance. She was scolded but never punished. Many UC workers — and students — were outraged. Breitbart News spoke to university students at the rally who said Sanders is the only Democratic candidate with a real presence on campus. They debated the relative merits of other candidates: former Vice President Joe Biden had “potential”; former U.S. Rep. Beto O’Rourke was “not as progressive,” and Rep. Tulsi Gabbard (D-HI) was “anti-gay.” “He’s got as good a shot as anyone, said one student. Students and unions — particularly nurses’ unions — were the engine behind Sanders’s campaign in California in 2016, though he came up short against former Secretary of State Hillary Clinton, who mobilized older, middle-class voters. In 2020, California’s primary will be held in March rather than June, making it potentially more important to the selection of the Democratic nominee than it has been in previous presidential elections.